If you are considering buying a pontoon boat cover and you are confused about what is out there, you owe it to yourself to read through this. Whether you buy from us or not, this will give you a good understanding of what is out there. Reading this could very well save you many hours of researching, thinking, and sorting information about boat covers. It also may save you many dollars. Reading this will help you make an educated decision concerning what pontoon boat cover you want. Again, whether you buy from us or not, if you are potentially in the market for a pontoon boat cover, you owe it to yourself to read this. It will only take a few minutes. We appreciate you taking the time to look. 1. The new Vortex Ultra 3 pontoon boat covers are suitable for storage, mooring, or trailering. Many covers are made for a specific type of use. Ours are made for all 3. 2. 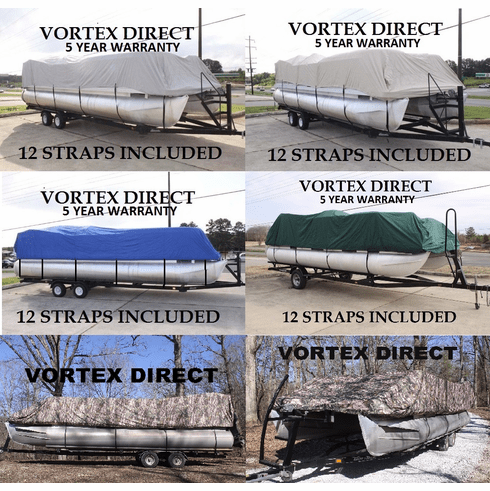 The new Vortex Ultra 3 pontoon boat covers have the best strap system available. Research has shown that straps over the top and completely under the boat do very little good. (Also, ever crawled up under a boat on a trailer to run straps? Ever bumped your head under there?) Our covers are made with a new system whereby a series of loops is sewn to the fabric and the strap goes through that loop, around your pontoon/and or trailer, and snaps together..very very simple and very very strong. 3. 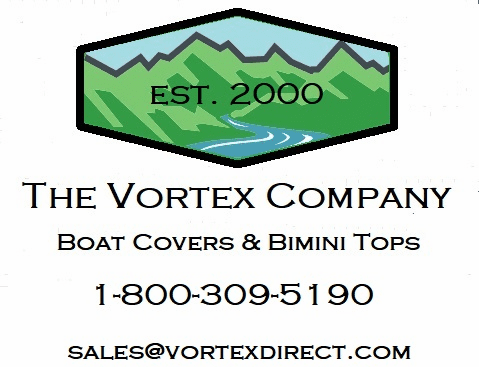 The new Vortex Ultra 3 pontoon boat covers do not have grommets to scratch your boat. 4. The new Vortex Ultra 3 pontoon boat covers have an elastic rope sewn into the hem..to help hold the cover tightly to your boat. This is very nice for mooring. Say you have your boat down at the dock and just want to cover it temporarily. Most likely, you would not need straps, etc for such a project. The elastic will hold it in place. Then, for storage or trailering, you can fasten the straps for a more secure fit. The elastic makes putting the cover on the boat much easier. It makes it a very easy 2 person job, and a reasonably easy one person job. 5. All of our covers are made from marine grade canvas that is proportionally 2 to 4 times as thick and heavy duty as most covers out there. We have several sizes for each main type of cover, and generally, we want to size a boat cover to fit as snugly as possible, but not so snugly that it will not fit! It certainly has to be big enough, but not too big. It often seems like a good idea to get an oversized cover, but, we have found, through years and years of experience, that the extra material is often cumbersome and difficult to deal with. So, unless you really have some outstanding circumstances, go with the smallest cover that will actually fit your boat. If in doubt, please call us, and we will help you figure it out. It is in all of our best interests to work together to get you the best possible cover. Also, for most types and sizes, we will have several colors to choose from. For most types and sizes, we will have blue, grey, beige, burgundy, and green. We really like the grey and beige covers. They are nice neutral colors and tend to hold up very well to the elements. This particular listing here will be for a particular size and color, but we will have all available options listed, or you can call us for assistance at 1-800-309-5190. For our pontoon covers, they are designed to generally fit like a fitted sheet. They are made to cover the top and sides, and the elastic cord sewn into the hem helps hold it on�.. We carry several lengths (currently 16', 18', 20', 22', 24', 26', and 28.) Even though these are cut for that particular size, such as 18�, 24�, 26�, etc, they will work for a boat that is a foot or two shorter than the given size of the cover. (To explain further how these are cut, the big piece of material across the top on the 26� cover is 26� long, big piece of material across the top on a 18� cover is 18� long, etc. Then, in addition to that big piece of material, there is more material that covers the sides of the boat..more info on that below!!!) Normally, if you have a foot or two of extra material, when you are dealing with something that is very big and long anyway, the extra material is just not significant. The elastic cord sewn into the hem takes up some of that potential slack, as well as does the taller items in your boat..seats, folded bimini, captains chair, etc. For example, our 24� cover is an excellent fit on a boat that is 22�1� up to 24�. You would not want to use that 24� cover on a boat that is shorter or longer than that 22�1� to 24� range because the next size up or down would be a better fit. Call us with any questions at 1-800-309-5190. We like to size these covers to fit the deck area of the boat, not just the playpen. These Ultra covers have the elastic cord sewn into the hem, and we like for that elastic cord to 'grab' underneath the edge of the deck all the way around. Sometimes, manufacturers of pontoon boats like to get all they can out of their descriptions and model numbers, so their measurements normally apply to the pontoons. So, of a boat is called a 24', that is generally referring to the length of the pontoons. The deck is what we want to cover, and that is the measurement that is important to us. Beware of what is stamped on the side of your boat, and of what your title says, etc. It can be a little misleading. Sometimes, it is best to measure, or call us. We can look it up for you. You want to size the cover to fit the deck area, and you want the smallest one that is not too small! For example, if your deck area is 22�7� long, you want our 24� cover. That 24� cover is best suited for a deck area that is between 22�1� and 24�. It is best suited for that size, and if your deck area is any smaller or bigger than that, we have one that will fit better, i.e. the next size up or down. Our covers come with tie down/hold down straps, as well as a storage bag. For certain applications, such as higher speed trailering, you may need to add extra straps. The material is heavy duty enough to support any reasonably paced trailering, but you have to eliminate the movement of the cover, which is very difficult. It is generally better to trailer uncovered, as it is just normally not worth the effort to prep a covered boat for trailering. Trailering is not covered under warranty, as there are just too many factors to figure in to cover those under warranty. How a cover holds up to trailering is tremendously based on the users prep work and attention to detail, and just cannot be a reflection on the quality or workmanship of the cover. These are very waterproof. These will collect water. If you are going to use this for storage or in any condition on your boat where rain could collect on it, we would highly recommend some type of support system. We have a great economical support system. Feel free to view it on this site, or call us for details. Some of our customers have had great success by building a support system or 'skeleton' with pvc pipe. Grey electrical conduit works very well and is even less expensive. People have used saw horses, an empty garbage can or two., etc. Often, you do not have to spend any money on a support system. Again, call us with any help. We will answer your questions. 1-800-309-5190.